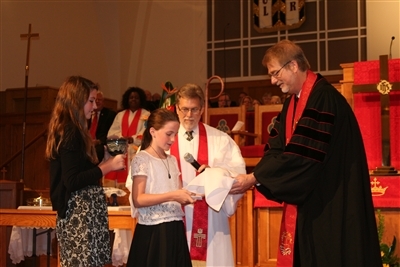 Natalie and Meredith Rideout of First UMC, Winter Park, present the paten and chalice as episcopal gifts to new Bishop Ken Carter as Dr. Bob Bushong, center, looks on. LAKELAND – About 500 people attended a worship service and received communion Saturday at First UMC as part of the official installation of Rev. Dr. Kenneth H. Carter Jr. as resident bishop of the Florida Conference. Many more watched the proceedings by live webcast. A video of the service is available on the conference home page. Carter came to Florida from the Western North Carolina Conference, where he was a district superintendent and chaired the Board of Ordained Ministry and the Committee on the Episcopacy. He also has served on General Church boards. He was elected bishop in July at the Southeastern Jurisdictional Conference, where he later was appointed to fill the office of retiring Bishop Timothy Whitaker. Other worship leaders included Rev. David McEntire, host pastor at First UMC; Dr. Bob Bushong, chairperson of the Conference Committee on the Episcopacy; Russ Graves, lay leader; Dr. Sharon Austin, South Central superintendent and dean of the Cabinet; along with pastors from several local churches. 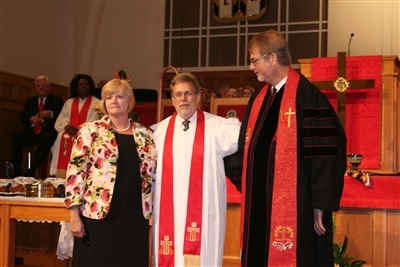 Dr. Bob Bushong, center, introduces Bishop Ken Carter, right, and the bishop's wife, Pam, at an installation service Sept. 15. The Winter Park Folk Trio from First UMC, Winter Park, opened the ceremony, and First UMC of Lakeland’s Chancel Choir and Clarion Brass led additional musical worship. Presenting gifts symbolic of the Episcopal Office were Rev. Bill Fisackerly III, retired; Dr. Anne Kerr, president of Florida Southern College; Walter Dry Sr. of First UMC, Spring Hill; Natalie and Meredith Rideout, First UMC, Winter Park; Jetro Jeune of St. John UMC Haitian Mission, Boynton Beach; Rev. Vance Rains, Florida State University Wesley Foundation; Rev. June Edwards, First UMC, Lakeland; and Rev. Matt Horan, Hyde Park UMC, Tampa. A reception for Carter and his wife, Pam, followed the installation service.